Khaman Dhokla or simply called as, Dhokla is a soft, fluffy, spongy and delicious steamed savory cake. Khaman dhokla is made from Channa dal flour or gram flour or besan (split and skinned bengal gram dal). It is slightly tangy yet sweet and savoury snack or could be a breakfast main course. Dhokla is one of the popular Gujarati delicacy traditionally made from a fermented chick pea batter and later on steam cooked in a dhokla steamer. There are many varieties of dhokla such as the khaman dhokla, instant rava dhokla, moong dal dhokla, white or khatta dhokla and so on. This delicacy, khaman dhokla is so often served with chutneys like mint or coriander chutney, tamarind chutney etc. Dhokla can be eaten either for breakfast as a main course, as a side dish or as a snack. Grind ginger and green chilli with little water. Take besan in a bowl, add the ground ginger – green chilli paste, water, curd, lemon juice, turmeric, sugar and salt to it. Mix well until no lumps remain and keep aside. Take a small, wide, flat and round shaped vessel or pan, preferably the dhokla steamer or even the idli steamer or in the pressure container and grease it generously with cooking oil. Mix the eno salt or fruit salt to the besan mixture, at the time you are going to steam. Mix well and ensure there is even mixing. Take a large pan or pot in which the small pan can fit. Add water in the larger pan and bring it to boil. Keep the small pan in the larger pan containing boiling water.Cover the large pan with a lid. Steam cook for 10-12 minutes till the khaman dhokla is done. Insert a knife to check if its done. If it is done, the knife should come out clean. Keep for 5 minutes to cool down and then invert it into a plate. Temper with the items given under ‘To temper’ table and pour over the dhokla. Cut into desired shape and relish. Do not add too much of turmeric powder. It may overpower the aroma and you may not be able to tolerate and eat it. While grinding the green chilli and ginger, use very little water and grind it into a thick paste. In place of fruit salt, add a teaspoon of cooking soda. Use ginger and asafoetida generously for a nice aroma. You can even add a pinch of asafoetida while tempering as well. Even one of my favorite snack 🙂 Thank you Vidya! 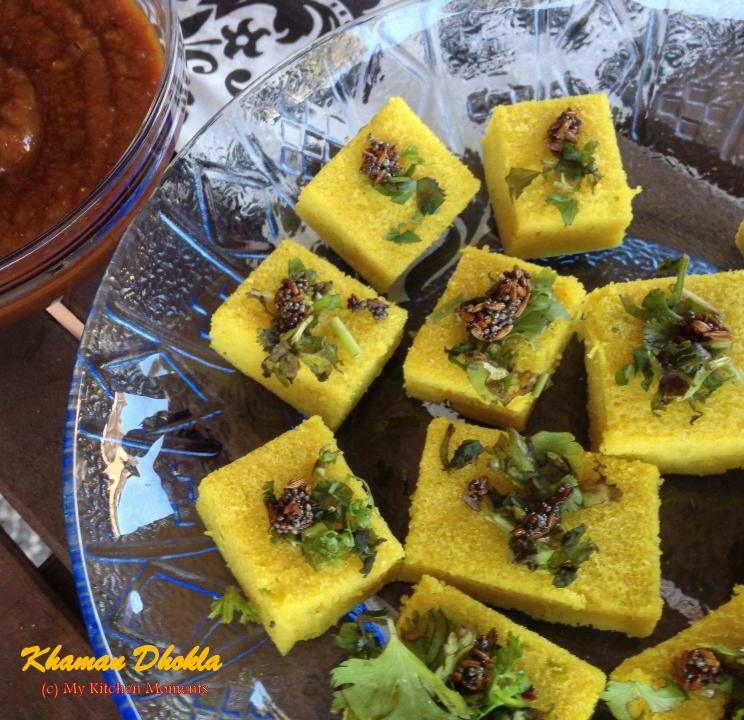 Dhokla- feel like grabbing one…..slurp…. I just love Dhoklas! !This pic sure brings a lot of memories of my sweet gujrati neighbours back in Tanzania 🙂 Thanks for the recipe dear!! ah.. a comment from a Gujju lady herself for my dhokla recipe means, a win for me!! Thank you so much Shruti 🙂 And the dhokla just tasted delicious and we at home relished it! Lovely texture and looks soft and tasty too! !